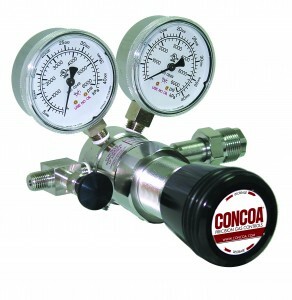 The 400 series high pressure regulators are quite unique and regarded as the best regulator available in the UK for its purpose. It can be used in several different areas of application depending upon your requirements, with both chrome plated brass and stainless steel single stage regulator options available. Both the 492 and 493 regulators are piston sensed and capable of receiving ultra high pressure up to 6000 PSIG. The 493 Series regulators are intended for primary pressure control of non-corrosive gases at a maximum inlet pressure of 6000 PSIG. Key Features – Single Stage, Piston Sensed, Ultra High Pressure, Chrome Plated Brass Barstock Body. Key Features – Single Stage, Piston Sensed, Ultra High Pressure, 316L Stainless Steel Barstock Body. Typical Applications – Airplane strut charging, Research and development laboratories, Chemical manufacturing, Aerospace hydraulic systems, Pharmaceutical manufacturing and Gauge calibration.